As a society we love brushing uncomfortable matters under the carpet - even if it means that we blind ourselves as an ostrich does by peering its long neck into a black hole so that it remains oblivious to its surroundings. But, unfortunately, the environment continues to still function in the exact same way! Irfan Kamal has undoubtedly made an impact in his first movie. Led by Shams Patel, who was awarded the national award, and the Goa Film Festival acclaiming it as the best movie, Thanks Maa is a heart-felt movie that creates a small ripple. This movie is shot through the eyes of street children, their diversities, their challenges but ironically it extends to the entire nation. 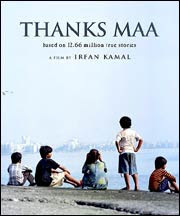 "Thanks Maa" highlights issues related to poverty, malnourishment, child abuse, pedophilia, and sexual harassment by family apart from child abandonment. While seeing the movie, I was reminded of Pinki Virani's "Bitter Chocolate," a book which I left unfinished. The movie is not a gripper, and it loses its way during certain parts., although the direction and acting deserve an applaud. But more importantly it bravely points out social issues that need immediate attention. It encourages one to fight for justice, for what is right and to voice one's concern. There is a certain undercurrent where everyone knows the truth, but when will we be ready to talk about it, let alone face or fight it? Here's the anti-climax. I went to see the movie in one of the prime malls at Ahmedabad on a Saturday evening. For company, I had 5 others housed in the huge multiplex theatre sitting miles apart from each other! In 2010, we still choose to be ignorant.. the fight has not even begun although the epidemic is evident.. but wait its still under the carpet.. lets wait some more..! this is true of any another country too. Its like the bell curve and will exist no matter what you do. i recieved this mail about our history and a letter written by one of the british generals then who travels the lenght and breadth of india and he says that he dint see a single poor person or a beggar or a thief. such was our nation then. its a vicious cycle now with some like you talking about it and dozens of others pushing it deeper under the carpet. The stats are alarming and its just getting worse.. sadly..!